We find Sir John Soane's Museum in Lincoln’s Inn Fields one of the inspiring places in London. Aside from being filled with fascinating artefacts, the architectural details are exquisite. Sir John Soane was a famed Neoclassical architect and his home reflects his remarkable talents. His best known public work was the Bank of England and Dulwich Picture Gallery where top-lit gallery design would go on to be a major influence on museum planning. In 1792 Soane bought three houses on the site, which he demolished and rebuilt entirely. The distinctive facade of white Norfolk brick still dazzles today. Inside is a beautiful array of eclectic objects and artworks, among them are his many plaster casts and Roman marbles. It's interesting to note the unusual way in which objects are displayed - rather than curating them in a chronological or geographic order, Soane instead opted for a creative display based purely on aesthetics. Since 2011 there has been a major restoration project to improve the museum to both develop the existing space and open up lost spaces which weren't seen before. If you haven't yet discovered Sir John Soane's Museum, now is the perfect time to explore the building and the exciting collection of artefacts. Jane Wilkinson, head of conservation at the museum, said “we view the actual spaces as works of art” - an approach which has a powerful resonance with the way we approach the spaces we work with. Travel remains a leading source of inspiration for Devas Designs and we are always excited to explore and discover cultural hotspots across the world. 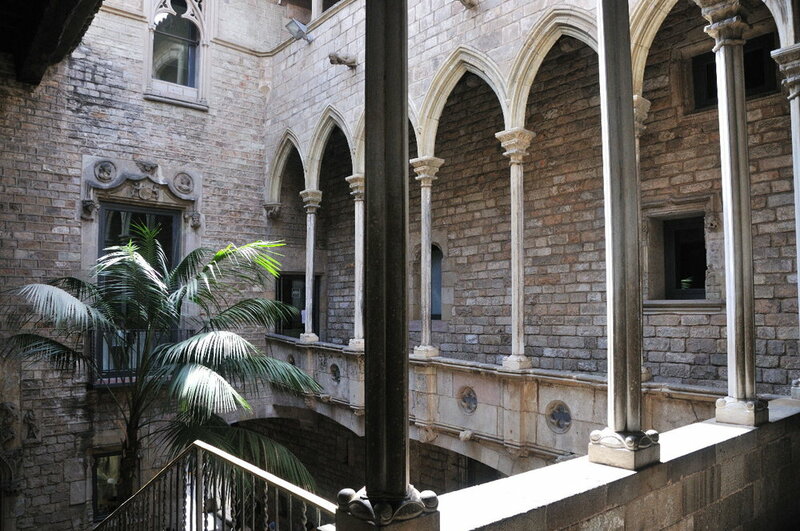 Recently one of our team visited Barcelona, a city bursting with colour and culture. 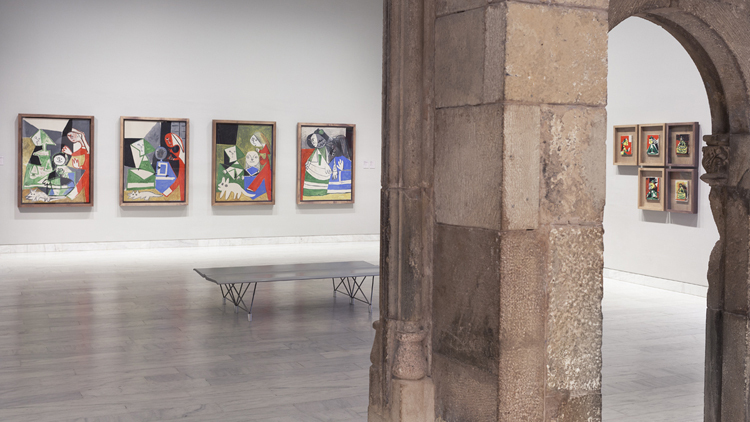 The Picasso Museum houses one of the most extensive collection’s of Picasso’s work with over 4,000 exhibited pieces. Comprising five medieval stone mansions, the museum is itself a beauty to behold with beautiful courtyards and winding staircases. Much of the collection focuses on Picasso’s formative years and the masterpieces he painted during his early teens - while not his most iconic works, they set him up as an artist of immense character and skill and it’s interesting to see his continual stylistic changes. A particular highlight was the room dedicated to his famous Blue period as well as a collection of Cubist paintings. 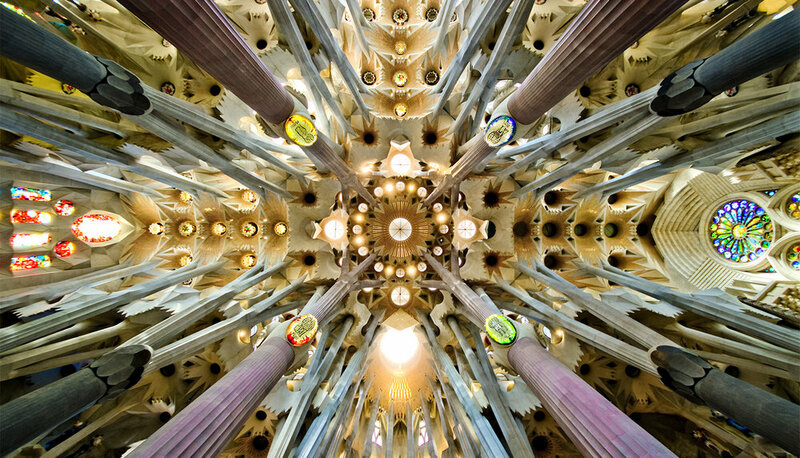 A staggering collection in a stunning setting, one of our must-see Barcelona sights. Sagrada Familia - It would be impossible not to mention Antoni Gaudi’s architectural masterpieces, his most distinctive creations are in Barcelona. The city’s shining glory is the Sagrada Familia, the giant basilica famously known for its continued construction which commenced in 1882. 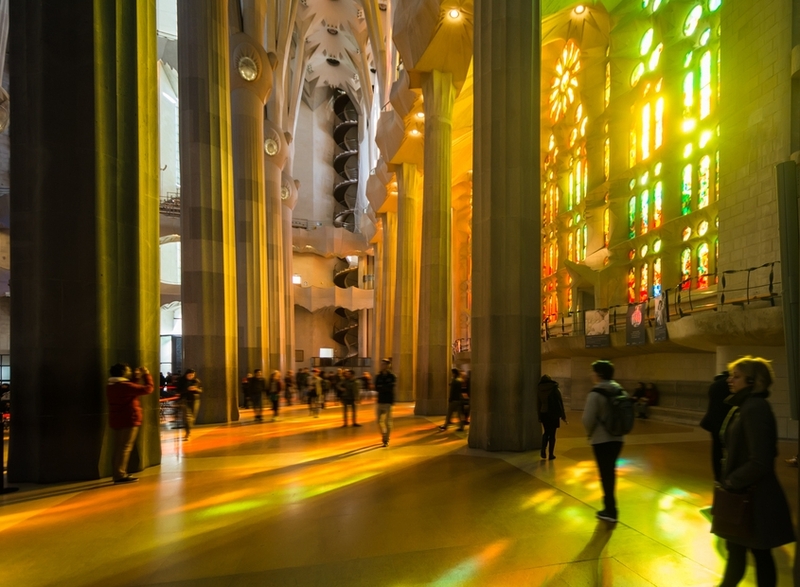 It’s a wild combination of Gothic and Art Nouveau forms and once inside, the stained glass windows cast a myriad of rainbow colours across the space. 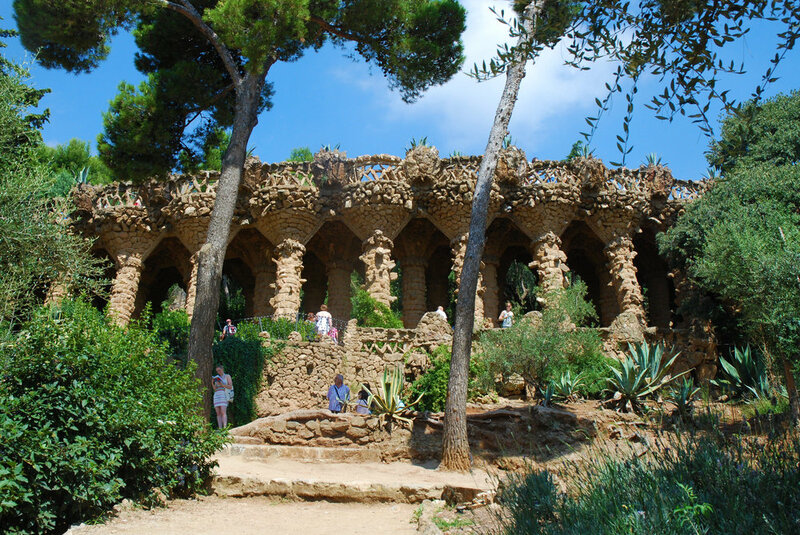 Park Guell - Perhaps our favourite of Gaudi’s creations due to its natural outdoor elements. It sits on Carmel Hill with views across the city, and provides a beautiful interplay of natural forms and mosaic decorated structures. The main section is ticketed, but the beautiful gardens remain to free to visit, their tall trees provide calm and shade above the bustling hot city in the distance. Casa Batllo - A smaller but no less impressive construction by Gaudi in the centre of Barcelona. 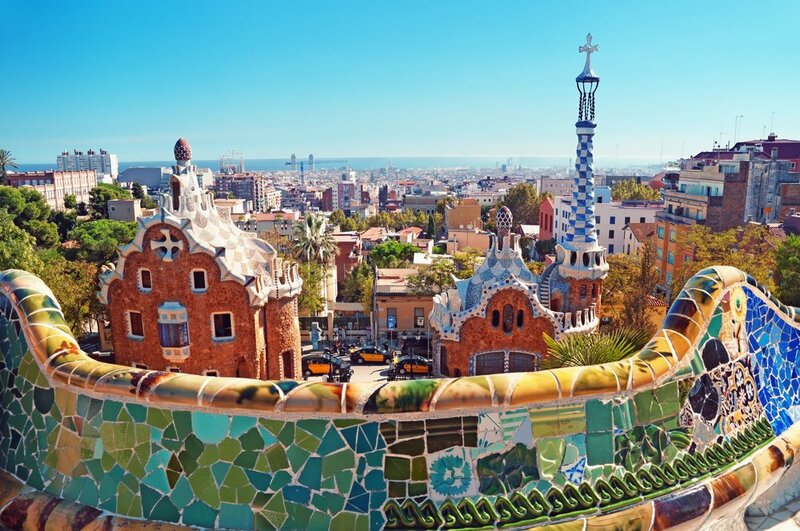 It encapsulates Gaudi’s unique take on Art Nouveau design with its elaborate facade covered in broken mosaic tiles. The skeletal-like balcony details and curved patterned roof again call on organic forms and fluidity. 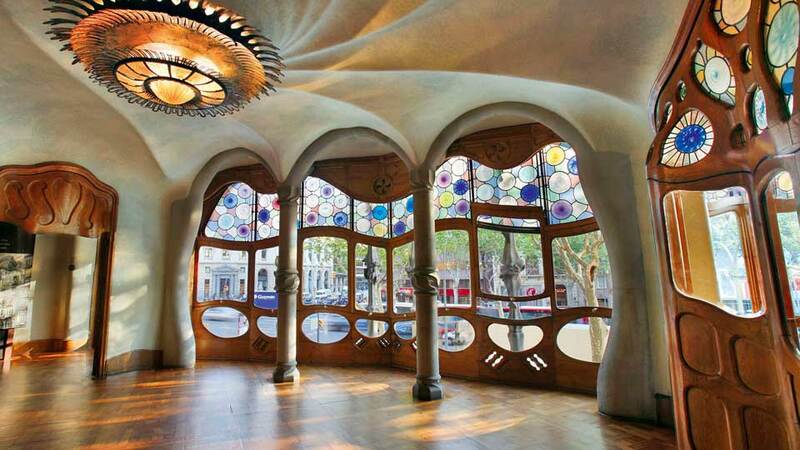 Inside the tiled room and stained glass windows are just as beautiful and arresting as its exterior. For those looking for a more contemporary experience, Barcelona’s Museum of Contemporary Art, aka MACBA, is the place to go. MACBA’s collection dates from mid-20th Century to the present day and is known for its hard-hitting modern displays - when we visited there was a riotous exhibition about the influence of Punk on modern art. Today’s blog comes from Palma de Mallorca and is inspired by our visit to the fabulous Rialto Living and their Mallorcan fabrics and colours. The Rialto Living building is itself a beauty to behold with its own interesting history; it originated as an 18th Century palace and in the 1920s became Palma’s legendary Rialto Cinema. In 2007 it re-opened as an interiors and lifestyle shop which now focusses on carefully-sourced local and European design pieces. They also have a relaxing cafe which is situated on the old theatre stage. While their fabrics and furniture are sourced from across Europe, they blend beautifully with Mallorcan designs and colours and we love their current sea-blue inspired themes. The details below like the rug, ceramics and lampshade, are key items that can both inspire an interior and tie together a room's colour schemes. There is a sewing workshop within the shop, where their in-house seamstress can tailor any of the fabrics or furnishings to suit your interior. We love this personalised approach as we often recommend that our clients go for bespoke options to make sure they get the perfect look and feel for their interior. The Ikat cloth designs you see across Mallorca have their roots in the East. It is thought that travellers on the Silk Route stayed in Mallorca along their journey, where the Ikat fabrics they were transporting were seen by locals. There are now a handful of Mallorcan companies who still produce these designs, supplying them to the island to continue this heritage. One of these is Teixits Vicens - we love their blue designs below as they are reminiscent of the seaside setting. Today’s blog is inspired by the work of Matisse and the touring exhibition ‘Matisse: Drawing with Scissors’ which is currently on display at the London Print Studio until June 11th. The exhibition lithographic showcases prints of Matisse’s famous cut-outs which he produced in the last years of his life. He produced these works in his eighties, using paper that had been hand-painted with gouache, cut out then laid back down in abstract or figurative patterns. Matisse said ‘the paper cut-out allows me to draw in the colour… Instead of drawing the outline and putting the colour inside it… I draw straight into the colour’. We also loved these images of Matisse’s studio in Nice c. 1952 and have been inspired by his bright and bold colours. The exhibition is well worth a visit and we were inspired by the colours we saw to source a few items inspired by Matisse. Take a look at our picks below to find out how you can introduce some colour into your home, subtly, for the Summer months. We found this beautiful removable wallpaper on Etsy by Kate Zaremba Company. Designer Kate Zaremba works as an illustrator and surface designer in Washington, she’s inspired by her childhood career in film and theatre as well as her trips to art galleries. We love the sense of play and creative imagination in her designs that comes from these influences. Take a look at the wallpapers below which have been inspired by Matisse’s cut-outs. Her wallpapers are self-adhesive, so easy to apply and remove. This is great if you’re looking to add some Summer colour and brighten up a room temporarily! The cushion below comes from Coverture & The Garbstore, who have a lovely shop in Notting Hill. They chose not to stock big brands and instead focus on independent and unique labels. This cotton cushion with a Matisse inspired print is designer by Bobo Choses and would add instant creative colour to your sofa or bed. They’ve also designed this fun beach towel, shown bottom right, if you fancy taking something colourful on your travels this Summer! You can count on Devas Designs to bring you regular updates and best buys from London’s auction houses! This week we bring you our favourite items from Sotheby’s ‘Collections and Collectors’ auction, taking place on April 28th. This sale is truly eclectic, bringing together a wonderful variety of objects in varying styles and tastes - Sotheby’s told us ‘there is something for everyone’ and we certainly agree. We have also been drawn to works by Paul Cesar Helleu when it crops up in auctions. Helleu is known for his drawings of beautiful society women of the Belle Époque era. He has a real sensitivity of style in both his drawings and engravings and although his female subjects typify the French culture of the time, their beauty and elegance become timeless. His son and grandson both became artistic directors of Chanel, so his style certainly had an influence on them! Bow works below are portraits of Helleu's own daughter, Ellen, there is a beautiful and touching sensitivity in the way he has delicately modelled her lips and hair. The French marble topped gueridon table below features a beautiful veined white marble top. In its centre is a marble roundel within a Sienna marble border and grey marble concentric rings - we love this amount of detail on an item that at first-hand appears simple in its design. The geometry and minimal tones give it a real elegance which would work wonderfully in a classic interior. This pair of Regency ebonisded and parcel gilt daybeds also caught our eye. They have a beautiful colouring and texture, having been upholstered in a reddy-orange velvet. These would look elegant and grand in a classic sitting room and compliment a rich, earthy colour scheme. We source items for clients so we are always looking out for unique items that can add charm to a room without the need for an entire redecoration. The four Louis XV panels below are a brilliant example of how antique items can transform a room, by adding panels like these, colour, flair and character is instantly created. For this week’s blog we were inspired by a recent article about contemporary art and floristry in the Financial Times magazine. This floral art sees artists working with flowers to create incredible, blossoming structures that blur the boundary between floristry and sculpture. Often vast in form, utilising this natural, delicate material creates a truly poetic balance. Daniel Ost is perhaps the best known floral artist. He has been creating floral art for over forty years and continues to mould his craft to suit contemporary trends. His current work integrates elements of contemporary design, with custom built structures that allow flowers to be weaved, hung or displayed around. We were struck by this orchid canopy structure, pictured below, which Ost created for King Baudouin of of Belgium’s 60th birthday. The canopy integrates both contemporary design and natural orchids. Another inspiring floral artist is East London based Rebecca Louise Law. She trained in Fine Art but her interests in nature preservation led to create floral installations. Speaking about her work she says that the ‘physicality and sensuality of the site specific work plays with the relationship between man and nature’. She transforms public spaces bringing in her floral creations to create a stunning display of dazzling natural beauty. If you’ve been inspired by these floral sculptures there are more permanent ways of integrating floral features in your home. Looking at the floral sculptures reminded us of de Gournay’s wallpapers. De Gournay specialise in hand painted wallpaper, fabrics, furniture and porcelain. Their wallpapers are based on 18th century Chinoiserie designs and always incorporate stunning floral designs. This month Bonham’s held a fantastic and intriguing sale of rare items. As the title tells us this is a sale dedicated to ‘gentlemen’s’ pieces, which seems to cause both bemusement and irritation from reviewers. Nevertheless, the sale hosts an array of spectacular items of furniture, objets d’art and unique, rare items. With love in the air and Valentine’s Day just around the corner we’ve selected a few of our favourite items which could be perfect gifts for your loved ones! For people who like to entertain in style, these gorgeous Edwardian silver candlesticks would perfectly compliment an elegant table setting. They were designed by William Hutton & Sons Ltd in 1904 and feature bases with shell corners. We were also drawn to these elegant silver Art Nouveau picture frames. They would look lovely grouped together to display your family photographs. The frame on the left features enamelled flowers, while the frame on the right has delightful details of twisting scrolls and flowers. For the young at heart or anyone looking for retro inspiration, this vintage amusement machine could be a real conversation piece to brighten up your home. It is coin-operated and features a spiral ball-bearing track and eleven winning shoots … dig out those old one penny pieces! This item below also makes for an interesting conversation piece and could be a great purchase for the sailor in the family. The set of marine signal flags and pendants can be displayed in their case on unfurled for greater decorative impact. Finally we thought this painting would be perfect in a townhouse or holiday home with a neutral colour scheme. It was painted by a member of the English Primitive School in the 18th Century and shows a view of upper Mossley with Alderman’s Hill in the distance. It is a calm, rural scene with a beautiful, subtle and muted colour palette. Following our blog about Christie’s Interiors December sale and the stunning works of art included, we also wanted to share with you our favourite items of design and furniture from the sale. This gold-painted model of a tree is an unusual addition and instantly caught our attention. It has been made from steel and wood, painted gold which imbues a real sense of glamour. Its design is in the style of Curtis Jere, the American metalwork company founded by Curtis Freiler and Jerry Fels. While the work above is styled on Curtis Jere designs, these two bronze skiing sculptures are originals by metalwork company Curtis Jere, and both signed ‘C. Jere’. Each has been cast from a model, one of a slalom skier and one of a young boy pulling a sled. They sit on sloping onyx bases, and we love the use of this material to evoke their snowy landscape. Curtis Freiler and Jerry Fels started C. Jere in the 20th Century, the company has since been sold and resold but their original designs such as this one are highly regarded in auction houses. This Chinese famille rose and gilt dish is a charming item. It is decorated with a pair of ducks and a lotus pond and also features a kingfisher perched on a peony branch. The gilt forward border adds an extra detailed feature which beautifully holds the design together. This dish is decorated in a typical Yongzheng Period manner and would be a wonderful addition to a collection. This next lot comes in an impressive size, it features ten French stained-beech dining chairs. We love simple designs like this, they have a timeless elegance that can work in both classic and modern interiors. There is a lovely elegance in their colouring as well, the tones of the stained-beech and mahogany balance beautifully with their pale grey fabric covered seat. You might have noticed how much we love attending auctions and sales in London. As well as antiques, we collect works of art for our clients. Some pieces are for their existing collections and some help us to tie together an interior through colours, theme and genre. We think it’s important to keep updated with trends in the market, particularly if you are starting what might become an investment collection. This month Sotheby’s launched a dedicated Scottish art sale. ‘Highlights of Scottish Art’ features eighty works by Scottish artists from the 19th and 20th centuries, including photography. The work of renowned Scottish colourist Francis Campbell Boileau Cadell is headlining the auction. His works for sale included this piece ‘The Cheval Glass’ from his much loved Reflections series. We love this series particularly as each work shows a subject in an elegant and stylish interior. Each subject stands before a mirror and their reflection completes the portrait. This work, also by Francis Campbell Boileau Cadell is beautifully vibrant. It depicts Florian’s Cafe in Venice and was strongly influenced by French impressionist painters like Cezanne. Cadell’s loose brushstrokes and free handling of paint give this painting a wonderful sense of energy. A work like this could perfectly enliven an interior and look dashing in a room with a neutral colour scheme. There were also some charming works for sale by Samuel John Peploe who experimented with manipulating colour and form. He loved using strong colours and even used gesso to prime his canvas so that his colours were as vibrant as he could get them. William Russell Flint is particularly known for his watercolours, so this work really stood out for us. He trained as a lithographer and was a prolific book illustrator. We loved the blue, green and grey tones of this watercolour, it would lovely in a classic interior of a similar colour scheme. This work has a romantic and wistful atmosphere that is beautify elegant, a sense of stillness pervades. A work with a subtle atmosphere and tone like this can perfectly blend into an interior, bringing a splash of colour and elegance without detracting from interior design and existing architectural details. As well as exploring New York’s incredible contemporary galleries, we visited The Frick Collection. The Frick is known for its outstanding collection of works of art from the Renaissance to the 19th century and includes artists such as Rembrandt, Van Dyck, Degas, Turner and El Greco. The museum also has a charming garden to relax in and was a serene environment to enjoy the collection. Giovanni Bellini is the most famous of the Bellini family of Venetian Renaissance painters. He revolutionised Venetian painting through his coloristic and sensuous style. This work below, St Francis in the Desert (c. 1476-78) shows St Francis receiving the stigmata. We loved the landscape which is painted with stunning detail and includes animals, birds, plants and objects like skulls. We couldn't help but be drawn to some of the more British works of art on display such as this portrait of Thomas Cromwell by Hans Holbein. German artist Holbein spent long periods in England where he painted the nobility of the Tudor Court. This terracotta sculpture by Jean-Antoine Houdon also caught our eye. It represents Diana the Huntress and its life size-scale is incredible. Houdon called on classical sources such as the Apollo Belvedere which inspired her long limbed, elegant pose. There were also some outstanding works by Titian on display. Titian is an artist who has always captivated us for his rich hues and alluring subjects. He is widely regarded as the greatest painter of 16th century Venice and when you face his paintings you can see why. The depiction of soft flesh and textures of fur is painted with extraordinary detail. You might have seen from our Twitter photos that we spent last week in New York, exploring the city and in particular its extraordinary art galleries. New York during the Autumn is a beautiful place, its colours and culture are truly inspiring. For those of you who have been, it will be no surprise that one of our highlights was visiting MoMA. We were lucky enough to catch MoMA’s exhibition of Picasso’s sculptures. It’s been highly anticipated as there hasn’t been an exhibition of this scale of Picasso’s sculptural works since 1967. Throughout his influential career, sculpture was a medium Picasso returned to time and again. He approached sculpture in an excitedly experimental way which we love. He blended both traditional and unconventional materials and methods, much like his paintings. The exhibition itself had over one hundred works on display, complimented by photographs and works on paper which was a lovely story telling device. Picasso’s ‘Still Life with Guitar’ (1912) really grabbed our attention. It has been formed in true Cubist style, with multiple angles modelled from cardboard. It was fascinating to see an artist whose career is triumphed though works on canvas with such a vast collection of sculptural works. We also enjoyed seeing how his sculpture informed his painted works and vice versa. We love the items in this month’s Collections auction at Sotheby’s. It’s a real eclectic mix of antique, classic, unique and collectable items. We wanted to share with you a selection of the items that really stood out for us. This exquisite piece instantly caught eye, it is a rare Vincennes group of Venus and Adonis (c.1750-52). L’Heure du Berger is represented by the reclining female figure in loose drapery, with a male youth balanced and twisting towards her. There is a real sense of elegance to this piece, aided by the white colouring. A smaller piece like this is easy to display and can add beautifully to an existing collection. While we enjoy sourcing all types of items for our clients, we love finding precious artworks. A unique and sensitive work of art can make a big impact in your home. This work by old master Rembrandt instantly stood out to us. The etching, made in 1630, shows the bust of a man wearing a high cap, and the model is thought to be Rembrandt’s father. The Italian 18th Century work below is a charming depiction of the temple of Clitumnus, near Spoleto. It has been drawn in pen and brown ink with a grey wash over traces of black chalk. Its limited colouring makes it versatile, and although it would perfectly suit a classic interior, it could bring character and charm to a contemporary living space. These George III carved gilt wood and gesso wall lights (pair) from the late 18th Century are truly exquisite. Both elegant and grand, they are typically characteristic of the neo-classical taste of late 18th Century England. They feature the typical classical urn, ram’s head and bell-flower garlands. This walnut dining table (c. 1970) is a real centre piece. Its simple design is both bold and elegant and it sits on six hexagonal shaped steel legs. This table comes from the collection of British filmmaker, Bryan Forbes, best known for directing ‘The Stepford Wives’. For this week’s blog we want to focus on fabrics. We just visited Chelsea Harbour’s Design Centre to source fabrics and were inspired by the incredible selection we saw. When we work on an interior design project, we often make use of high quality and beautifully printed or painted fabrics. High quality fabrics can be used for either furnishing or wall coverings and can really infuse charm, colour and elegance into your room. Whether you are choosing fabrics for furniture and small furnishings or larger wall coverings, it is crucial that the colour and design tie in with the look and feel of your interior - if you’re completely drawn to a fabric it can even inspire your overall colour scheme. Elizabeth Eakins set up her rug and textile business in 1978, with a focus on making by hand. All of her fabrics are made from natural fibers and include linen, hemp and wool blends. We were particularly drawn to this natural hemp linen fabric, ‘Esther Young’ in azure and rose. We also loved this fabric from Harlequin’s Amazilia collection. The fabric has been digitally printed for accuracy with botanical-style representations of hummingbirds in beautiful and crisp colours. The detail is exquisite and would add both a splash of colour and a real sense character to either a classic or contemporary interior. Parisian company Pierre Frey has always been a favourite of ours. Founded in 1935, they remain a family owned company who design, create and manufacture fabrics, wallpapers, carpets and furniture. They are real ambassadors of french taste and integrate french craft and style into their work. We loved the fabric below, from the Collection Braquenie, ‘Les Muses et Le Lion Rouges’. This Toile de Jouy fabric was based on classic designs from their archive. Our favourite colour was this rouge celadon, which is both bold and elegant. Turnell and Gigon distribute beautiful fabrics which range from both classic and contemporary designs. The designs below, percale persan would add a real charm and character to a room. We loved these deigns in cream and blue colours, the coloured detail looks beautiful over these subtle backgrounds. This month’s ‘Made In Britain’ sale at Sotheby’s had an impressive collection of works from Britain’s leading artists, designers, photographers, ceramicists and printmakers. The sale aimed to celebrate the diversity and innovative spirit of these British artists and really succeeded. We had a difficult decision choosing just a few of our favourites, but take a look at some of our highlights and let us know what caught your eye! Howard Hodgkin’s work always catches our eye for its expressive colouring. The work below, entitled Moonlight (1980) is a beautiful lithograph printed in colours with additional hand-colouring. Hodgkin is one of Britain’s most important printmakers and painters and his bold style is completely captivating. Since the 1970s expressive patterning has dominated his work, combining printmaking techniques, bold brushstrokes and bright daubs of paint to produce punchy abstract works that would instantly enliven a room. There is a finely balanced tension that we find interesting in Victor Pasmore’s work; the balance of saturated colour and fine black strikes. We were drawn to this piece entitled Senza Titolo (1991) for its unified hue. A work like this can really inform a colour scheme if you are designing a new interior, or help to tie together an existing colour scheme. We are inspired by works of art and their expressive colours and often use them as starting points for a new project’s colour scheme. There was also a fantastic selection of ceramics on sale. The four pouring vessels by Rupert Spira, below left, are beautifully elegant in their shape and blue glaze. We were also drawn to the ceramic pieces on sale by Lucie Rie. The footed bowl, below centre, has a beautiful matt blue glaze and bronzed rim. On sale were also ceramics from one of Britain’s most respected and influential potters, Bernard Leach. The fluted bowl, below right, is made from porcelain with a celadon glaze. Its size, form and neutral glaze give it a sense of timeless elegance that would sit beautifully in either a modern or classic home. We were also struck by the painting on sale by Mary Fedden. Fedden’s work is characterised by her use of bold, often contrasting, expressive colours. The vivid colours in the painted still life, below, left, with reds, purples and greens would really bright a vibrant splash of colour to a neutral room. We often enjoy pairing vibrant works of art with interiors that have muted colour schemes, and tie it in with details like cushions that work with the colours. With the Tate’s major retrospective on this month, we were also looking out for works by Barbara Hepworth. The lithograph printed in black and yellow, below left, is beautifully harmonious and would perfectly compliment an interior with a muted and subtle colour scheme. The screen print, below right, by Ben Nicholson has been printed on woven silk. The delicate quality of the material blends beautifully with his subtle and sensitive colour scheme. Whether your interior is modern or classic, works of art that are elegant and subtle like this piece can really add charm to your home.